Transformed from a dark and dated space for a young couple remodeling their home near the ocean, this master bathroom is influenced by Mid-Century Modern design with natural elements. 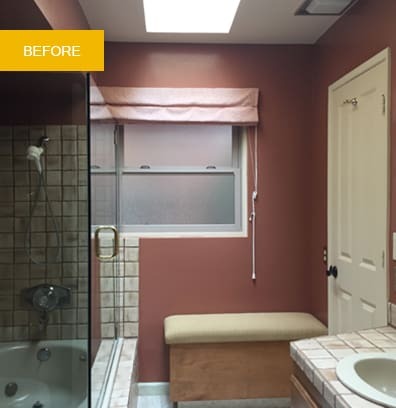 Their existing bathroom was dark and dull and had a cramped layout. The couple decided to remove the tub in the original bathroom and use the space for an extra-large shower. The new design features a stunning combination of patterned tile, interesting textures, gleaming metallics, and a color palette that is both calming and visually dynamic. The shower boldly balances four types of tile to create a design that invigorates the senses. The shower window was elongated to enhance the ocean view and designed to align perfectly with the shower opening. Rain glass was added to the bottom to allow light in while retaining privacy. Large mirrors framed in black were custom designed to complement the shelving and mounted to overlap the tile and float slightly from the wall. 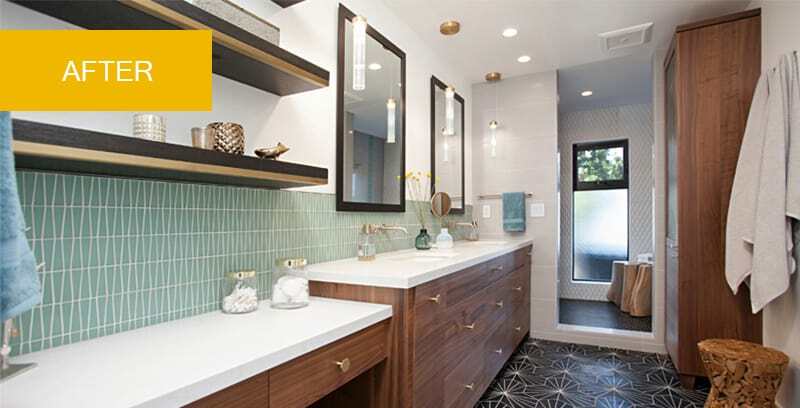 Reflective surfaces throughout the bathroom amplify light and make the space feel larger. In a vanity area for storing jewelry and displaying collectibles, the black and brass of the floating shelves elegantly balances with the flooring. Now a tranquil, luxurious space for relaxing and reinvigorating, this stunning master bathroom reflects connection to beautiful natural surroundings in its artistic balance of surfaces and materials.